Rapidly growing e-commerce industry requires website owners to be more flexible and competitive, and selecting Magento platform is one of the best options to withstand the current industry trends. But what to do if you originally selected a platform that is not so feature-rich as Magento. We know the answer to this question – Migrate to Magento! However, it would be a mistake to claim that migrating an ecommerce store from one platform to another is that simple. It’s definitely a more complex and challenging process than the most of shop owners think. We have migrated websites many times and faced a lot of problems while doing this. 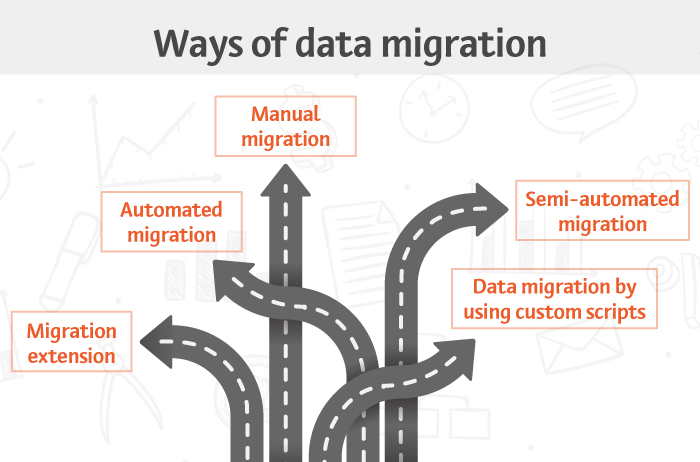 So, we have decided to outline a range of tips and tricks for you to make the entire migration process less challenging and more effective. The reasons are pretty obvious. Only we wouldn’t call migration a “fun”, unless you are an experienced Magento developer that has dealt with migrations many times. In the most cases, online store migration is a time-consuming and demanding process. And, it is important to understand the basics to eliminate mistakes and problems. SO MIGRATION. WHAT DOES IT ACTUALLY MEAN? Migration is the process of bringing the data and other website elements to the new platform. DATA, DESIGN, FUNCTIONALITY. That’s what can be migrated from the old store. Usually, merchants migrate only the data since design and functionality transfer basically means building the site from scratch, just with the same look and functionality. Most often, they decide to refresh the design and develop new and more exciting features. Product data including product categories, attributes, description, images,extra fields, variants, category images, etc. Store data including configuration details, user accounts, email addresses, etc. Customer information: customer shipping and billing addresses, passwords etc. Transaction data: quantities shipped, amounts invoiced, etc. In fact, almost all data can be migrated. However, you should keep in mind that the more data should be migrated the more time migration will take. To reduce costs and time for migration determine the most relevant data and migrate only it. Yes, it is still used :). If you have a couple of hundreds of products, this option is for you. All that you need is just to copy and paste the data from one online store to another. This procedure is not going to take much effort; however, it can be pretty time-consuming. And, the data that can be migrated this way is very very limited. It is widely used for data migration. Usually, this way takes less time (compared to the manual option) and minimizes expenses. But you should be prepared to face hidden problems that can arise during the migration. There are a lot of automated migration tools for Magento, but the most popular of them are Cart2Cart and Migrashop. Cart2Cart allows migrating products, customers, orders, manufacturers, product categories, attributes (but not attribute sets), images and other content of the existing online shop. It’s OK for standard shops with no advanced functionality and customization. However, if your Magento store is heavily customized, automated migration is not the option you will be happy with. Before using Cart2Cart on your live site, we would recommend you to test it on a staging server. Use a free trial migration to understand whether this tool will work for you or not. The huge advantage of Cart2Cart migration service is that it provides affordable prices and you can even estimate your migration costs. Besides, Cart2Cart offers a lot of different services to choose from: recent data migration, migration insurance, migration preview service, migration from database dump and many more. Compared to Cart2Cart Migrashop is a pretty limited solution. It supports data migration only from 11 shopping carts while Cart2Cart allows migrating data from more than 50 ecommerce platforms. With this tool you can migrate such items as products, categories, customers, orders, manufacturers, currencies, product images. For some migrations it’s more than enough, especially taking into account low pricing of Migrashop. You can calculate costs using Migrashop price calculator. Here we are going to cover two most popular semi-automated migration tools — Magento native importer and MAGMI. If you can bring your data (products, customers) into a CSV format (you, the lucky one ;)), then you can use a built-in Magento importer. Everything you have to do is to export the file from the old platform, edit the data in a spreadsheet editor and then import it into your new Magento store. The CSV file has a specific structure, so in the most cases, you will need to adjust it to “Magento look”. The only thing is that not all shopping carts allow exporting files in a CSV format. It will definitely take some time to convert and clean the file. Plus, there are several issues you should consider before using Magento importer. The first one is that you can migrate only simple products. If you do not have configurable products (what is a very rare case nowadays) that’s not a problem for you at all. But if you have, after the file with the data will be uploaded to the new Magento store, you will need to create configurable products manually. It will work for sure with a couple of hundreds of products. However, if you have several hundred thousands of products, it is obvious that it will take like tons of your time. The same for categories. They cannot be migrated. The next issue you may be concerned with is migration of images. Via CSV and other automated services only paths to images are transferred, but not the files themselves. Since the paths of Magento and your existing platform paths differ, you will need to transfer the files via FTP and upload new valid image paths via another CSV import. And, this sounds pretty frightening, doesn’t it? To automate the creation of custom CSV files, a script can be written. But again, easier said than done. In simple terms, this custom script is a piece of code that will literally do the time-consuming work of CSV file creation for you. And, of course, you can do it only if you are experienced in coding. The other way ― to hire Magento developer to accomplish this. But more on this a little bit later. However, if we are talking about millions of records, you will definitely need a more speedy solution than the native Magento importer, and MAGMI could be a good choice. The huge advantage of MAGMI is that it allows you to create a CSV file with the structure you want. It can include the data that native Magento importer does not upload — for example, multiple images. But you should keep in mind that MAGMI requires advanced knowledge of web technologies since it needs to be installed on a server and configured properly. This tool is heavily dependent on server settings and with wrong configuration can make you suffer. A lot. 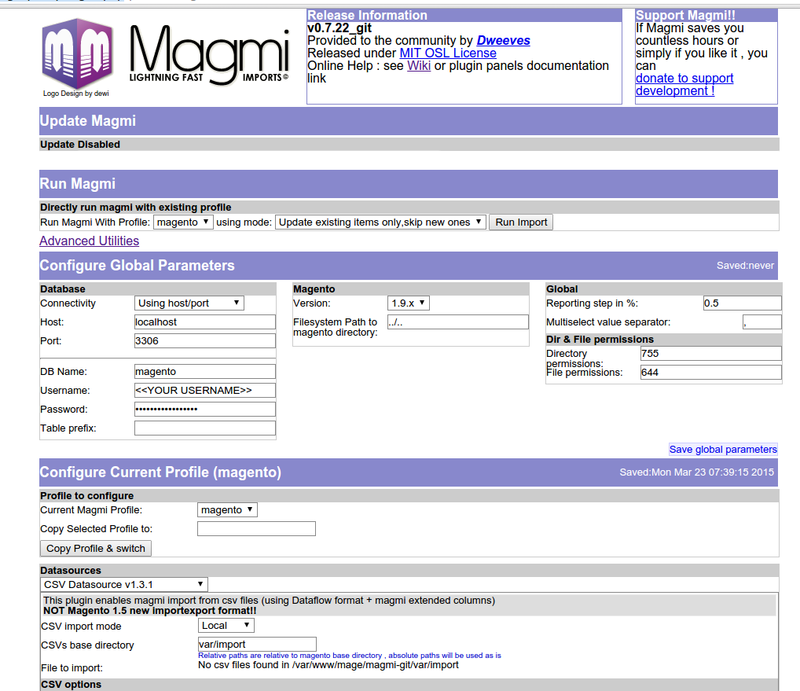 One more thing about MAGMI is that it does not require filling out the required fields, unlike Magento native importer. On the one hand, it’s convenient. On the other hand, if you have forgotten to fill out some fields you will need to add them either manually in the backend of the site or import those missing fields additionally. Why we like MAGMI so much is because of its incredible speed. It can handle imports of squillions of product rows and it’s extremely fast at it. If you need to migrate configurable, grouped, bundle products and products with custom options — choose more advanced migration options than Magento importer and MAGMI. There are two extensions we would recommend using when it comes to more advanced migrations. Which of them meets your requirements you can learn from official documentation. Here is some brief information on both extensions. 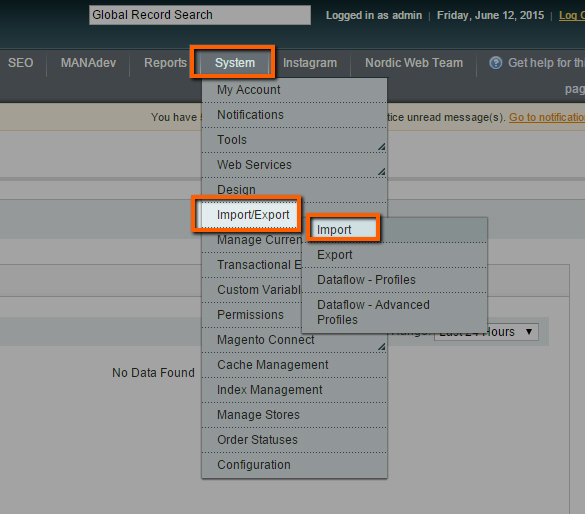 This extension allows you to customize bulk import/export process in accordance with your demands. Want to migrate all product types, tier pricing, custom options, multiple images and other tricky data? That’s where this extension can help you. Besides, you can use this extension for regular price update and quality data. Also a good extension if you need to migrate such advanced data as custom options, configurable and grouped products, related products, upsells and cross-sells, tier and group prices, multiple images etc. There is a possibility to test it on the manufacturer server and check whether the functionality of this extension is exactly what you need or not. As you have already understood it’s rather a task for professional Magento developers or at least for people with experience in web coding than for businessmen. The whole thing may seem very confusing and complicated, but if you have an in-house developer or intend to outsource this work to a reliable Magento development company, there are no reasons to worry. The huge advantage of this option is that this solution will be tailored to your specific needs. And, if you need to import data on a permanent basis, you can ask your developers to create a custom importer, not just a one-time solution. There are three scenarios you will be offered when it comes to migrations by using custom scripts. Direct migration from one database to another. In this case, the data will be transferred from the database of your current system to Magento database. The script will pull the data from the old database and import it into a CSV file that can be edited manually or by script. Afterwards, the CSV file can be uploaded to Magento system via native Magento import or by using another custom script. If the data is stored in no-SQL database (they are provided by various cloud services such as AWS, Azure etc. ), your developers will use API of those services providing the data in a specific format (usually XML) to migrate the data. But you should take into account why those services are actually used on your current website and whether it’s more reasonable to integrate two systems rather than to migrate the required information. As a rule, cloud services store very large amounts of data. Is it your case? Then, it’s really advisable to integrate Magento with those services since Magento (Community Edition) will simply not cope with great amounts of data. The other reason why no-SQL databases are used is that they often store data from different systems and services (ERP, CRM etc.). In this scenario migration is justified if you want to reduce the number of systems you have to maintain and, so to say, to get everything “into one basket”. But that also means that you have to transfer at least partially the functionality of those systems into Magento. Consult with a company that provides Magento development services. The most of them offer free of charge initial consultations so you can get all answers to your questions even if you plan to migrate the data yourself. If the design of an existing website is good and there is no reason to change it, it can be transferred to the new Magento store by a team of developers. Basically, it means that a new design theme will be developed from scratch with the only difference that instead of a PSD file the developers will have a website as a reference. Magento has a specific structure of folders and files that, on the one hand, makes it very flexible, and on the other hand, doesn’t allow you to use the code from the old website. If for some reason you are determined to transfer the design, you should still keep in mind that you will still have to make some changes to the primary design. Especially, when the interface of the initial shopping cart differs a lot from Magento. Every ecommerce platform has specific features, and Magento has them too. For example, customer profile and checkout can differ, just like any other element. And, if you want to use the functionality of Magento native features, they should be added to the design/interface. To understand the differences between your current shopping cart and Magento have a look at both shopping carts and compare elements that are present there. Determine what blocks/elements should be added or removed. 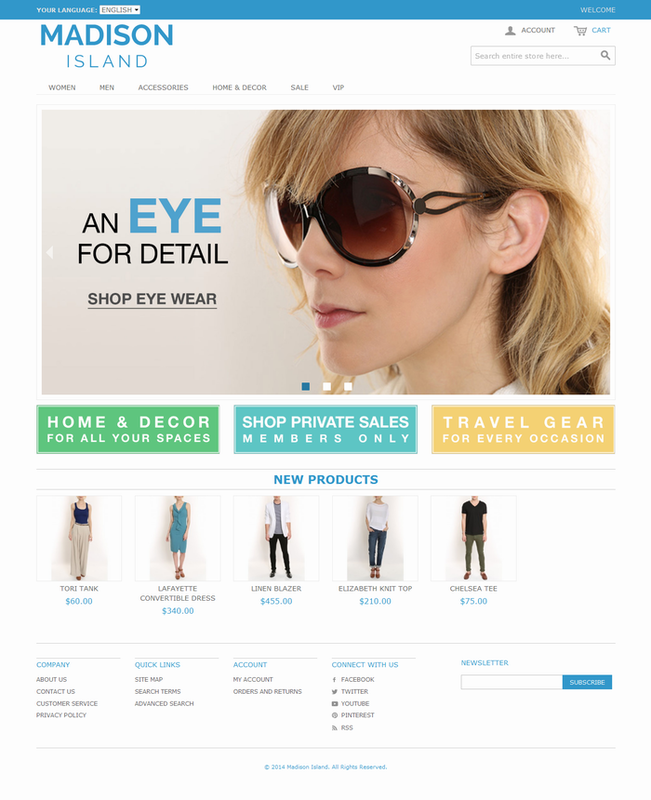 Below you can see a screenshot of Magento Community frontend. We are sure that if you are familiar with the design of your current site you will definitly see some differences at first glance. Magento has a variety of exciting features. That’s one of the reasons why online merchants migrate to Magento. You can have a look at the list with Magento features to understand those people who choose Magento. Even if Magento does not include some custom functions your old website has or your business operations require, it is not a problem to add them. Want to implement alternative sales model? — There are dozens if not hundreds of ready solutions waiting for you. Plan integration with 3rd party services like CRM, ERP, POS, or Accounting Systems? — You will definitely find some ready solutions for the most popular systems. With this purpose you can visit Magento Connect — Magento official marketplace and have a look whether the needed extension is available there. And, even if you won’t find what you are looking for, it can be developed by professionals. Before contacting Magento development services provider, familirize yourself with functionality Magento has to offer and then make a list with custom features you want to add to Magento. It will just save you some time. Below you will find one of the possible scenarios to get migration done that will give you some overview on the process. 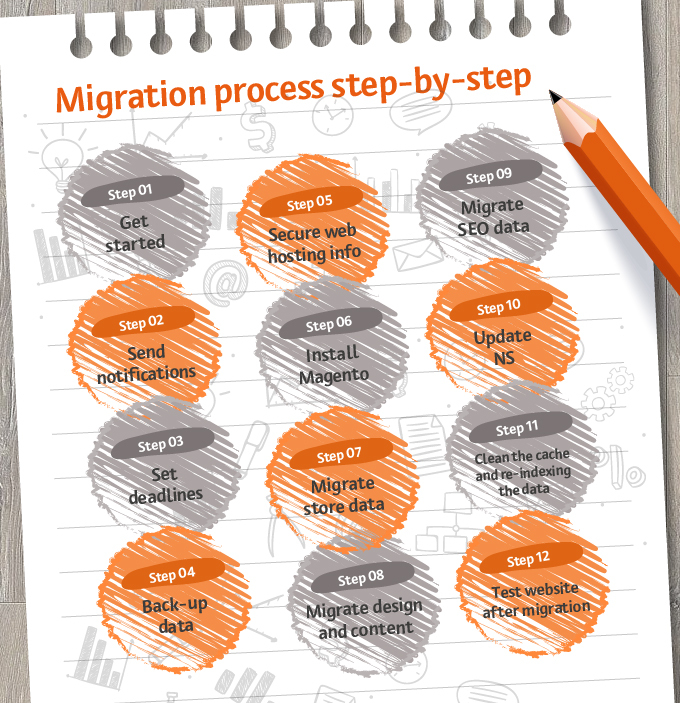 Walk through the technical steps involved in the migration process. Map the existing website architecture against Magento one to ensure that you are able to redirect all key pages and you are not going to lose any rankings as a result of losing targeted pages. Migrate existing meta content onto the new version. Generate as many keyword reports as possible that will allow you to see changes once the new website has gone live. 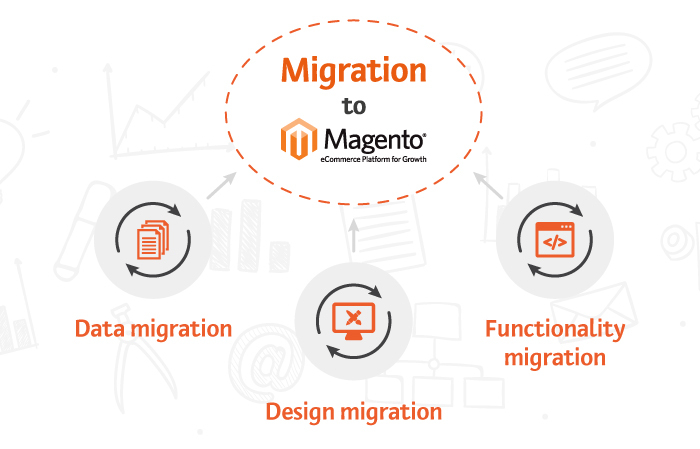 We have covered the major aspects of migration to Magento. If you still have questions ― feel free to contact us. We have a way more information for you.